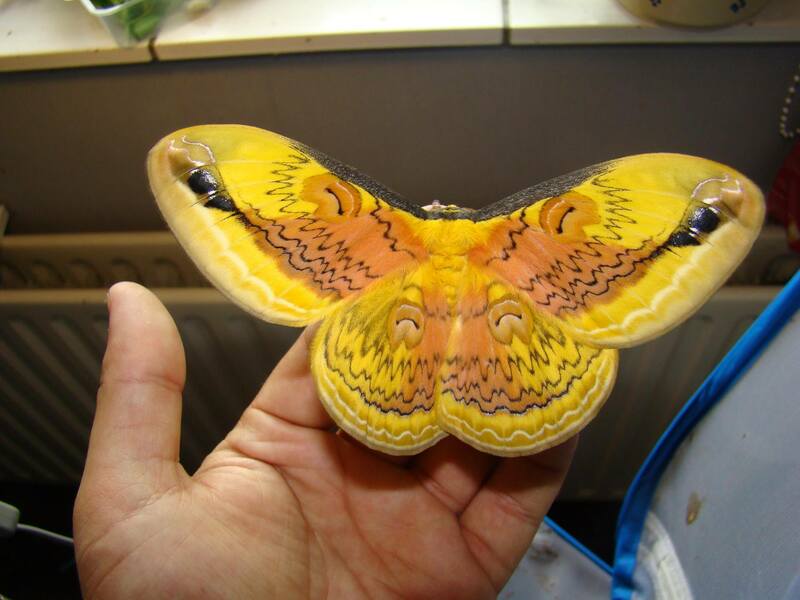 Loepa oberthuri — “Oberthür’s silkmoth” | Welcome, visitor! 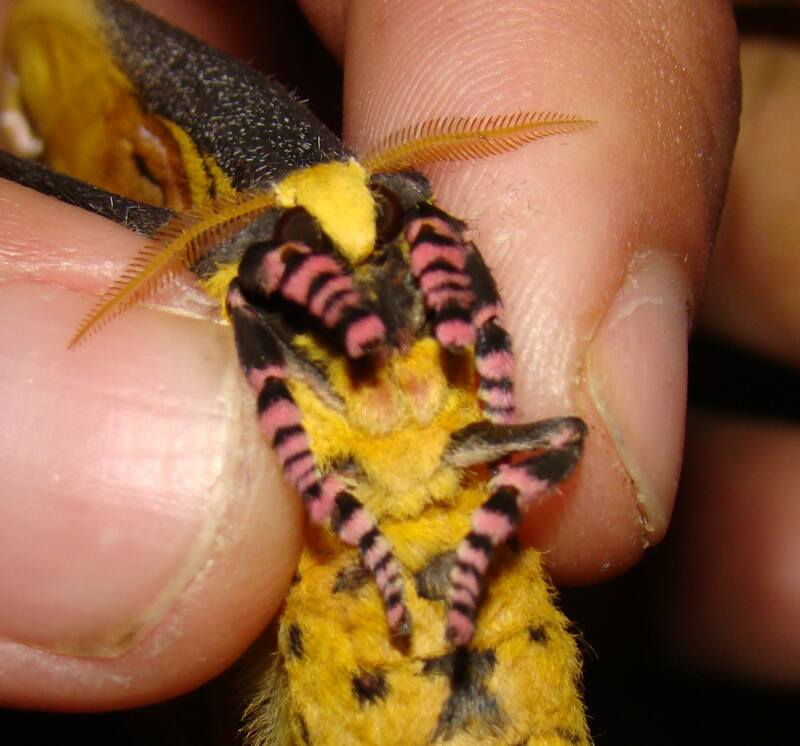 Loepa oberthuri is a beautiful yellow silkmoth from China that feeds on Vitaceae vines. 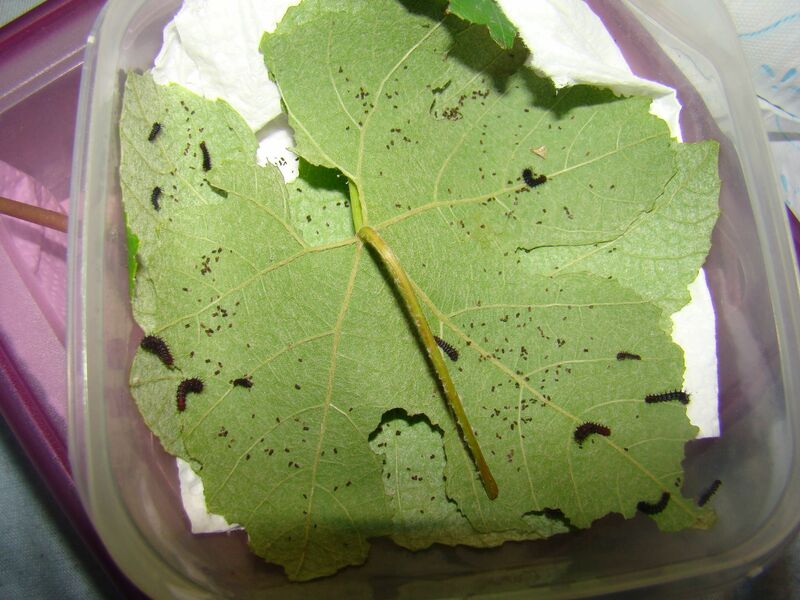 They have one generation a year and overwinter as cocoons; the larvae feed on grapevine (Vitis) but also Parthenocissus. Collectors and breeders love them for their bright yellow/orange appearance, remarkable and wooly larvae and pink/black striped legs. It originates from a subtropical climate and has only one generation a year; pupae overwinter in cold, but not freezing conditions. Genus Loepa is an Orentiental genus of beautiful yellow to orange silkmoths that can be found throughout Asia. Host plants: Vitis (grapevine), Parthenocissus (viriginia creeper) are the main host plants. Secondly Salix (willow) and Citrus are also reported as host plants, but are not recommended for optimal result. In the wild, this species mainly uses Vitaceae vines. Special notes: Keep very well ventilated and not overcrowded. Loepa oberthuri is a silkmoth with only one generation a year; the cocoons take a year to hatch, only after being stored cold for several months. At this stage they overwinter, and will never hatch if kept warm. The que for them to start developing in the pupa is being warmed up gradually after having experienced a long period of cold. After being warmed up, the moths hatch in the following months, usually during summer. The moths are nocturnal and pair at night. The eggs of Loepa oberthuri hatch in 10 to 15 days time, depending on the temperature. 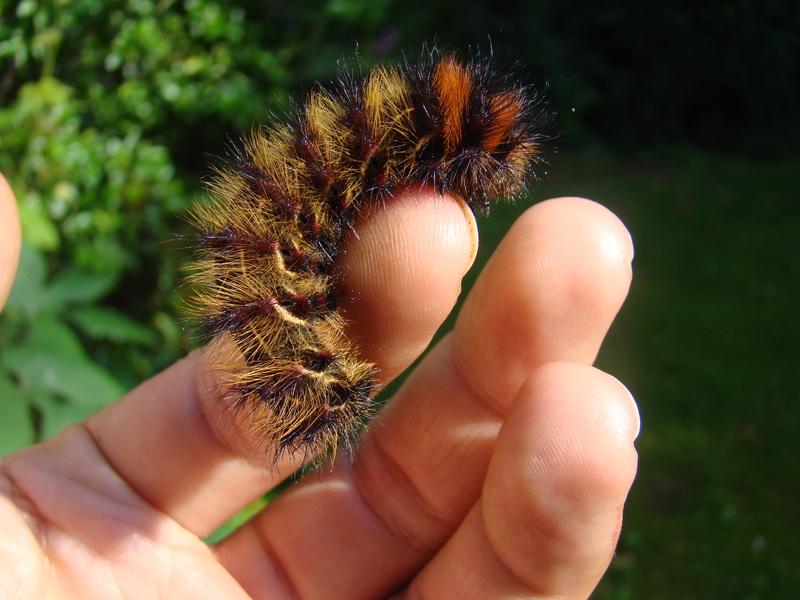 The caterpillars of Loepa oberthuri do have a few special needs. First of all, they are best reared in a well-ventilated environment. They do not prefer to be raised in completely airtight containers, and like a lot of airflow and space. Personally I raise them within “rearing sleeves”, usually on grapevine (Vitis vinifera). After hatching from their eggs however, the first few instars can be raised in small plastic boxes; in these stages they are so small that can escape the rearing sleeve or succumb to other predators like spiders, predatory bugs and other. 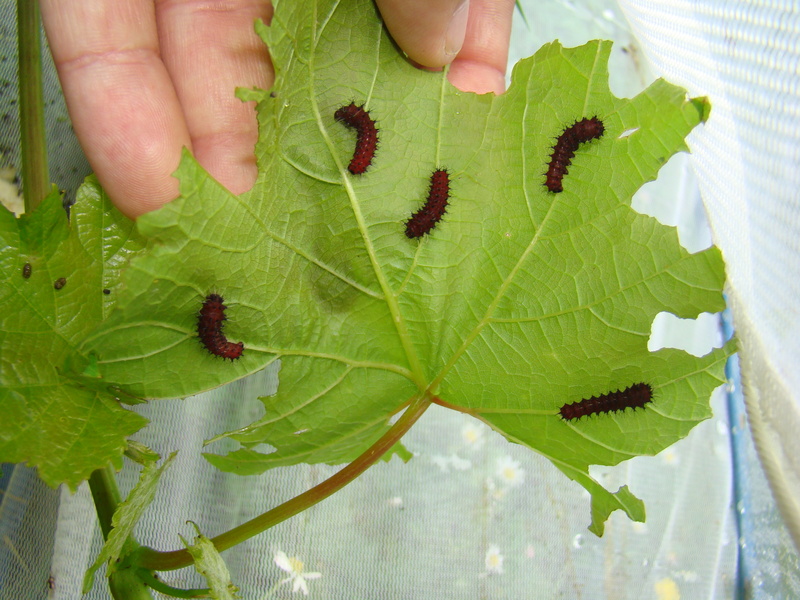 They are best raised to the second or third instar before releasing them in sleeves. Of course, this depends on your local climate. This species comes from a subtropical climate; they don’t need to be very warm or humid, but they will not appreciate cold spells and constant rain. Especially continuous rainfall, which can be common in summer in some geographical locations in Europe or America, where they do not occur in the wild but where many hobbyists attempt to raise them, may be the cause of them getting ill or infected. They appreciate temperature of around 20 to 25 degrees Celcius, and can survive colder temperatures. Cold nights seem to be no problem for them either. 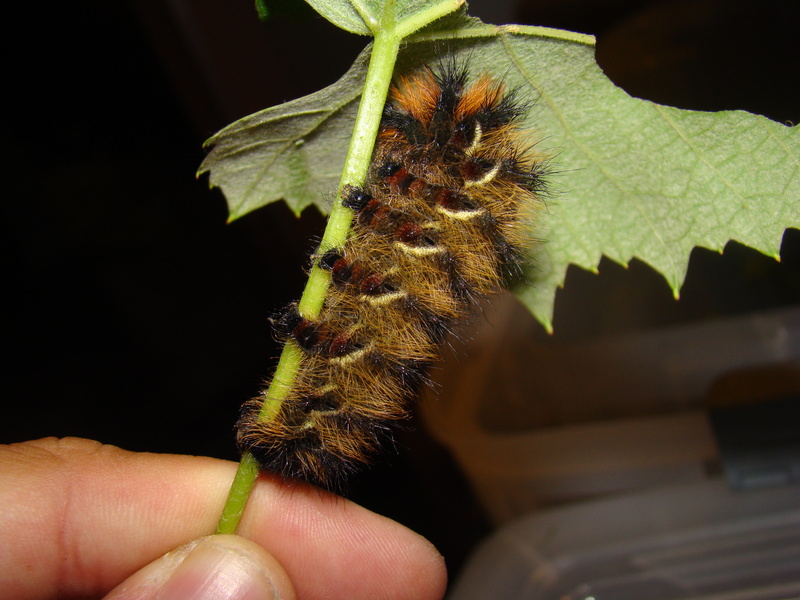 After the third instar and beyond, the larvae will be rather fluffy and red. At this point they can be safely places in a cage or sleeve, with some Vitis vinifera. If you choose the right location to do this, they will basically rear themselves for you with no need for intervention, unless they have eaten all the food! A few important things to keep in mind are to: 1) shelter them from excessive rain or bad weather outside – rain is tolerated, but not constant rain for many days and 2) shelter them from excessive sunlight, it is best not to place the cage in the full sun, or atleast provide a sheltered place for the caterpillars to hide if it gets too hot – I always place my cages in a spot with some shadow. Keep in mind that they come from a subtropical climate where it is often 25C or hotter during the day, but that species that feed on Vitis and Parthenocissus do have the ability to hide within the thicket of leaves/vines to shelter themselves from the sun. Generally they appreciate warm days however, but it is all with moderation, something that varies in a lot of places. It is not exactly the best quality picture in the world.. but this picture illustrates how I rear Loepa: in my garden, inside a rearing cage they cannot escape from. 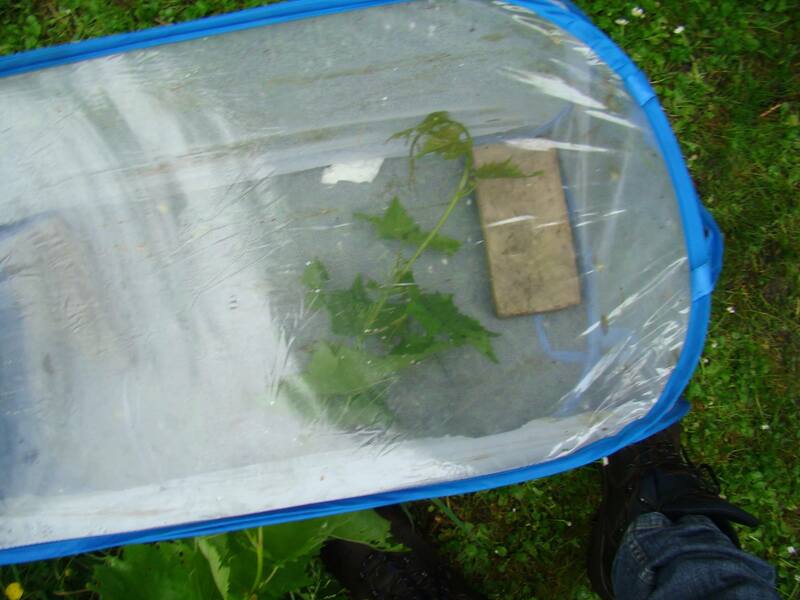 It has one opening that allows the Vitis vine to go through into the cage. The brick is there to keep the tent from flying away if there are strong winds! Loepa are not the fastest growing silkmoths, and may take 2 to 2.5 months from egg to fully grown caterpillar. The fully grown larvae are beautiful and covered with brown/yellow hairs (and orange hair on the thoracical segments), and sharp blue/black setae. Note: the setae (or “spines”) of Loepa are suprisingly sharp and thin! However, due to the thick layer of fur that covers them, they are rarely felt. However, if handled roughly, do not be suprised to suddenly feel a sting! The spines are not venomous or dangerous, they are just very sharp, something that makes them hard to swallow for predators and may discourage attackers. They feel similar to cactus spines! When they are done, the larvae spin interesting looking oval cocoons. These cocoons must be overwintered and stored cold, for they will never hatch if they do not believe winter has passed, and experiencing cold is vital for their development. Note that this species does not experience harsh winters in China; where it lives, the average winter temperatures are 5 to 10 degrees Celcius. Although the cocoons are thougher than we think and can handle more cold than that, it is not advisable to keep them below 0 degrees Celcius (the freezing point). While the cocoons may be able to withstand frost to some degree, prolonged exposure to freezing temperatures may kill them. It is best to simulate the “milder” winters they experience in their own environment. A tip could be to store them in a wine cellar, basement, or reasonably isolated garden shed, within a well isolated box. Of course depending on your local climate! 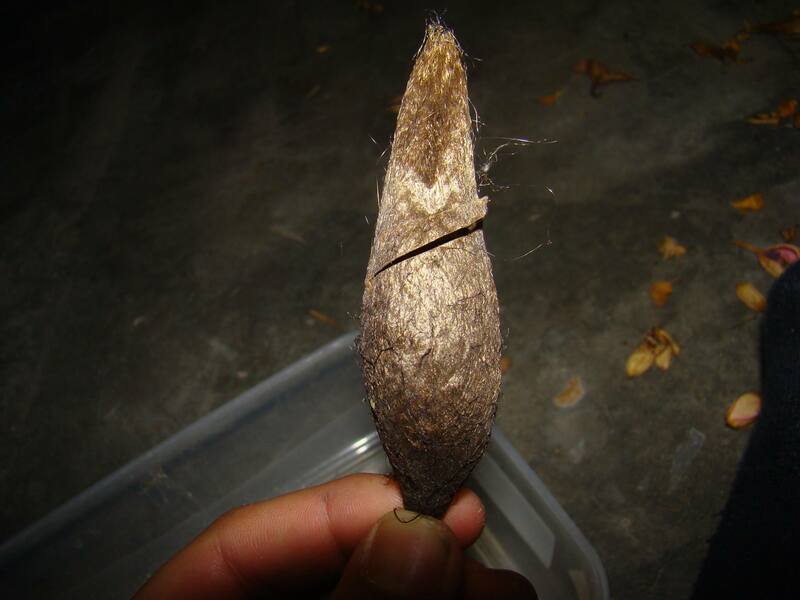 The cocoon of Loepa oberthuri – rather pointy! The adults usually live 7 to 15 days and do not feed. Some individuals in captivity, for some reason, refuse to pair whatsoever; while others seem eager ot pair. For this reason, to increase your chances, it is better to keep a higher number of them than usual. Females are slightly bigger and more “rounded”. Showing the legs of Loepa oberthuri that have nice patterns. Before you ask; no, I usually do not hold my moths like that, but this was for the purpose of showing the legs. If you happen to be lucky enough to obtain livestock of this species, thanks for reading this and good luck. Keep in mind not to overcrowd them, keep them clean and not wet, and they will be fine. Unfortunately Loepa caterpillars are sensitive to infections, and in some cases I have lost entire broods due to illness, although they are really easy to keep when the summers are just right; warm, a bit dry and sunny.